If you run into a tick or even a nest of ticks, sticking strong tape on your clothes or skin, then stripping it off can remove many teeny ticks. If it has dug in, you can have a tick on you for hours before it finds a good spot to dig in, so don't panic if you find one. If you check your skin periodically, you are likely to get it off you before it feeds. 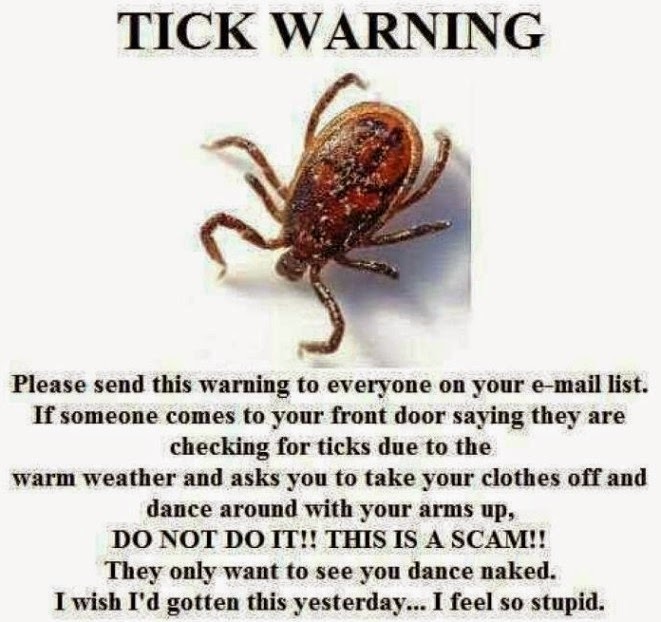 Even if a tick (or mosquito, if you're in tropics) doesn't carry the disease, you'll just feel a lot better knowing you didn't become lunch. This video from University of Manitoba show exceedingly clearly how to remove a dug-in tick without breaking off mouth parts still attached to you -- our leading lady has bravely allowed a real live tick to embed in her arm, so have a look! This page from Runners World also has a great video on how to remove a tick properly and some pointers on avoiding and dealing with tick bites, but since its code wouldn't embed, you'll have to click here to view it. Wear long-sleeved shirts and long pants (trousers!). Light-weight clothes, such as Buzz-Off pieces, can keep most of your skin cool and protected. Wear light-colored clothes so you can see insects while they are still on the outside of your clothes. Wear an insect screen hat, jacket, or full body suit. These look kinda dorky, but they really keep the bugs away from your body if swarms are particularly fierce. 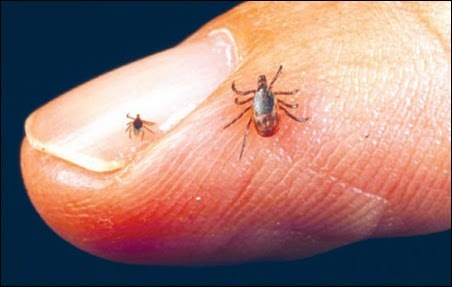 After your hike, run, walk, or frolic in a vegetated place, take a shower and check all over your body for ticks. It's the small ones that are hardest to spot.